After being the poster child of post crisis European recovery, Germany is suddenly facing the combined threat of deflation and recession. German GDP contracted in Q2 and industrial production has slumped across the summer. This is not a positive backdrop for German power demand. But there are factors ahead that may prevent a weakening German economy from translating into further declines in power prices and generation margins. After being the poster child of post crisis European recovery, Germany is suddenly facing the combined threat of deflation and recession. German GDP contracted in Q2 and industrial production has slumped across the summer. German exports have also sharply declined in August despite a weakening Euro. This is not a positive backdrop for German power demand. But there are factors ahead that may prevent a weakening German economy from translating into further declines in power prices and generation margins. New build: In the last 5 years approximately 10GW of wind, 30GW of solar and 10GW of new thermal (hard coal, lignite and gas) capacity has been commissioned. This can be compared to a little over 10GW of retirements (the majority of which are nuclear closures). There is also another 6.5GW of capacity (mostly hard coal) still under construction which will be commissioned over the next 2 years. The pace of new build has led to a substantial capacity overhang which has helped to drive higher variable cost thermal plant out of merit. In addition, the increase in solar and wind output has acted to flatten intra-day price shape pulling down peak prices. Coal price slump: Gas-fired generators have suffered the double edged sword of a surge in low cost new capacity and an erosion of competitiveness as a result of falling coal prices. 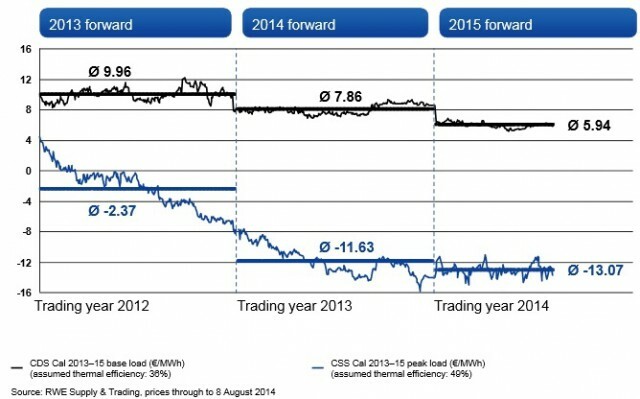 With gas-fired plant removed from the margin, wholesale power prices are now predominantly set by coal fired plant. As a result the post financial crisis decline in coal and carbon prices has fed through into a steady decline in wholesale German power prices as shown in Chart 1. Weak demand: After a snap back recovery from the aftermath of the post-Lehman shock in 2008-09, power demand in Germany has also steadily declined. This is due to a combination of increasing embedded generation, energy efficiency measures and weaker post crisis industrial demand. 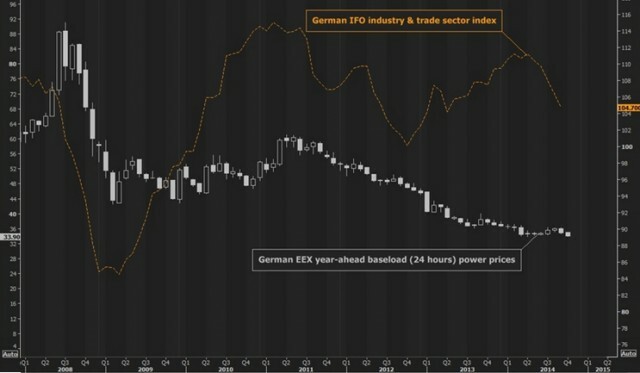 Chart 1 shows the recent downturn in the IFO German business confidence index which is pointing to further declines in industrial demand. After 5 years of events that have consistently reinforced the downward trend in German power prices, it is easy to extrapolate a pessimistic view into the future. This is particularly true if you subscribe to the theory that Germany and its neighbours are falling back into recession. But there are several factors that are working against a further substantial decline in power prices and generation margins. Lignite on the margin: While hard coal plants dominate German marginal price setting, the factors described above are increasing the number of hours where lignite comes on to the margin (e.g. in periods of high renewable output and low demand). The variable cost of coal plant is driven predominantly by the cost of imported coal (a global traded commodity). However the variable cost of lignite plants is determined by local extraction costs at strip mines. It is harder to define the true variable cost of lignite plant than it is for coal plant, but it is in the order of 25-30 €/MWh. This is not far below the current level of year-ahead power prices (see Chart 1) and it represents an important support level going forward. Coal prices: For the moment, API2 coal prices remain the most important factor driving German power prices. We wrote last week about how global coal prices had fallen below the long run marginal cost of new production and how export supply was being curtailed as a result. In the medium term these factors are likely to stem the fall in coal prices (although further price declines are certainly a possibility in the near term). But exchange rate movements are diluting the effect of falling global coal prices for German importers. The Euro has fallen almost 10% over the last six months, substantially offsetting the API 2 coal price decline across this period. If the US dollar continues to rise against the euro, this will act to support German power prices. A stabilisation in forward German gas and coal fired generation margins this year is evident in Chart 2. Plant closures: Under recently instated rules, plant owners planning to retire assets must submit an application to be approved by the German Federal Network Agency (BNetzA). Around 7GW of capacity has already applied for permanent closure, with BNetzA anticipating a total of more than 11GW of retirements by 2018. The volume of mothballing and retirements may increase significantly over the next few years given the inability of generators to cover costs at current dark and spark spread levels (shown in Chart 2). The large utility players in Germany continue to rationalise their generation portfolios as they face balance sheet constraints. Germany’s third largest generator Vattenfall may well sell its power portfolio and exit the German market all together. Capacity mechanism support: Unlike the UK, Germany is in no rush to implement a new capacity market. Ample interconnection and the current capacity overhang are supporting security of supply, even if there are some increasingly acute localised transmission stress issues. The Ministry of Economic Affairs and Energy has commissioned three studies that investigate German power market design. The Ministry is expected to release a green paper setting out its thoughts on market design next month. This will then go to public consultation with a white paper expected in Sep 2015. There is pressure on Germany to implement a capacity mechanism as part of a broader European solution, despite the UK and France already having acted unilaterally to support capacity returns. While the nature of the solution is as yet unclear, it is a reasonable assumption that a capacity mechanism will be in place later this decade in order to support thermal generator fixed costs. Both utilities and funds are treating the German power market with extreme caution. This is understandable when you look at the current market landscape. The important question is to what extent this is reflected in market expectations, investment decisions and asset prices. Sentiment on thermal generation assets in Germany is now very negative. Coal plant margins have been eroded with stiff competition from both renewable and thermal generation new build. Gas plants have been pushed out of merit, now representing ‘out of the money’ options that incur a substantial cost of carry (in the form of plant fixed costs). But we have described a set of factors above that may act to support energy margins. In addition generators may benefit going forward from the implementation of a capacity mechanism and increasing reserve margin (as transmission stress rises). The key challenge investors face in valuing thermal generation assets is understanding how these factors drive asset margin risk/return distributions. The German power market is also a key driver of pricing and generation margins in neighbouring markets such as France, Netherlands and Belgium. So the logic in this article extends across North West Europe, although the capacity situation varies by country. It appears to us that there may be some interesting generation investment opportunities in Continental Europe over the next two to three years. The challenge will be to find the right assets in the right locations at the right price.